It is ten to five. The hall of the Wroclaw Music Theater Capitol for seven hundred places is packed. Luxurious red velvet chairs are occupied by the high-quality audience – the respected Polish intellectuals. The agitation and intrigue are in the air: will a Polish get the Angelus? Which of the seven equally strong finalists will take the Eva Rossano’s work of art home? Nearly at the last moment a brunette wearing a recognizable short haircut and a laconic high-necked red dress enters the hall at a brisk walk. Oksana Zabuzhko. Just from London. She gave a lecture at the Days of Ukraine in Great Britain… She greets her Polish friends and exchanges a few phrases with the organizers. She takes a seat in the first row. Yurii Andrukhovych is already sitting on her left: he was invited as the winner of 2006. When the clock struck five in the evening, the lights went down and the projector lit. The award ceremony started with the German or, rather, Polish punctuality. Traditionally each nominee is presented in a short performance. The names of short-list novels and actors reading the extracts from them are changing on the stage and only the theater group wearing black hoodies is staying the same. The last presentation, the monolog of the journalist Daryna Hoshchynska (the main character of the novel The Museum of Abandoned Secrets) in an openly provocative image, different from the one presented in the novel was unexpected. A girl with a chaotic hairdo, wearing an open T-shirt with a skull, denim mini-shorts and net tights. A vulgar image. The main character of The Museum… is perceived in a different way in Poland and Ukraine. After a long ovation at the end of the performances Natalia Horbanevska went up to the stage to reveal the intrigue of the evening… The winner was the woman in red. 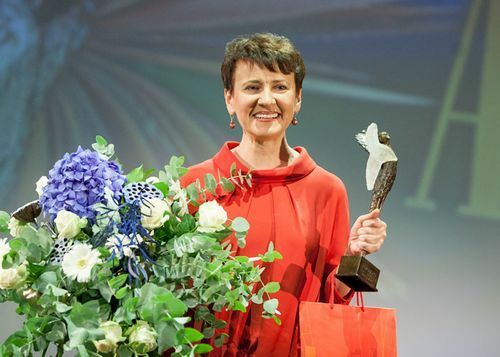 “This year we decided to give the award to a brilliant book which interlaces the history and the modernity, the reality and the magic, love, betrayal and death,” Natalia HORBANEVSKA, head of the jury of the Angelus Award explained their choice. The moved laureate shared her feelings: “At this moment I understand why the Hollywood stars start crying when they receive an Oscar. This morning I was in London and was signing this book in English. In my head there is a mix of many languages. Wroclaw is unreal for me now. Ukraine has been appraised in Europe! Thank you, Wroclaw.” The day before Oksana Zabuzhko worried a lot that political biases might affect the assessment of a novel about UPA taking into account the present international situation. Interestingly, Kotynska has translated Natalka Sniadanko, Tymofii Havryliv, Yaroslav Hrytsak, Natalia Yakovlenko and the book by Andrii Andrukhovych The Twelve Rings that won the Angelus in 2006. However, only this year they introduced an award for translators. “I got it for both books,” Kotynska laughed.